A rare thing occurred today: I saw an article in the newspaper that made me proud to be a Christian. It was the article Environment a Growing Cause Among Christians from the Sunday edition of the Pittsburgh Post-Gazette. It tells the story of Leanna Stitt, a young woman who’s learned to integrate her faith with her passion for the environment, and is now teaching others to do the same. Read this article and pray that God will bless her ministry. Unfortunately, the fact that this story is considered “news” means that our culture has until recently seen people of faith as unconcerned with the well-being of the environment. Many Christians will argue about how the earth was created, but avoid caring for God’s creation. But what if our Christian obligation to steward the earth has much deeper historical roots than today’s environmental movement? What if concern for creation was actually something we Christians inherited from Judaism? Earlier this month, I finished reading Jon Levenson’s Resurrection and the Restoration of Israel. In it, he traces the development of the doctrine of an eschatological resurrection of the dead in the history of the Israelites. The doctrine was first explicitly articulated (i.e. Daniel 12:1-3) in the second century B.C.E, but has antecedents throughout all the Hebrew Bible, as Levenson works hard to demonstrate. Most interesting for me, though, was that in the final chapter of the book resurrection is connected to God working within creation to bring new life out of death within the created order. Resurrection is an environmental event. Levenson writes, “the religion of Israel did not effect a radical separation between history and nature or pit the God of history against nature. Quite the opposite: the order that we call ‘nature’ (a term with no counterpart in biblical Hebrew) is closely bound up with God’s action in history, and when his kingship, so often challenged in history, is finally secure, nature flourishes richly along with the human community that does his will” (Resurrection and the Restoration of Israel, [New Haven: Yale Univ. Press 2006] pp. 207-208). Chew on that quote for a while. The healing of creation, resulting in resurrection of the dead, is the ultimate consequence of the Kingdom of God coming on earth!!! Levenson goes on to speak of the image of the “Divine Warrior” in Jewish tradition, a messianic figure who brings the reign of God on earth, healing human disabilities and ultimately conquering death (pp. 207-216). As Christians who believe that the Kingdom of God was inaugurated on earth in Jesus Christ, we have to recognize that our confession that Jesus is the Risen Lord implicitly demands that we seek the well-being of the earth over which He is Lord. Creation-care is inherently Christological: environmental activism is thus a practical outworking of a belief in the resurrection of Christ. I preached at Greenfield Presbyterian Church yesterday, and I used this illustration at one point. While in college in Boulder, Eileen and I both frequented a burrito place called Illegal Pete’s. The burritos there are delicious. Even thinking of it now is making my mouth water. Beans, rice, sour cream, hot salsa, chicken, guacamole, peppers. Pure savory goodness. (For Pittsburghers reading this, think of Chipotle, but with the ingredients mixed up and much, much more flavor.) So, while in Boulder last Tuesday, Eileen and I were quick to take Mike (who’s listened us pine for Pete’s burritos as long as he’s known us) to Pete’s. He enjoyed it and we were pleased. We had successfully shared with Mike the good news of Pete’s burritos. Contrast that with the experience I had settling into my seat on the airplane home: All I wanted to do was sit and read. I was tired, frustrated, and just wanted to hide in a book, deliberately ignoring the strangers sitting around me. Of course, I knew that there were probably people around me who didn’t have a living relationship with Christ, but that didn’t make me eager to strike up conversations. And then the convicting thought came: why am I more eager to share with friends the good news of a burrito than the good news of the Kingdom of God? Yes, there are differences between the two situations – most importantly the fact that Eileen and I developed a close relationship with Mike before sharing with him the goodness of a Pete’s burrito. This was relational-burrito-evangelism. But still, even in the context of good friendships, how often do we rush to tell friends about our favorite restaurant, book, or musical artist, but shrink away from sharing the much greater news of the Gospel? Why is it easier to tell someone about a burrito than about Jesus? There is something about the grandeur of Colorado’s mountains, about the expansiveness of the sky here, and the vastness of the deserts that humbles a person. The majesty of Creation calls us to slow down, give thanks to God for the beauty of this world, and then reflect on how small we individual human beings really are. Perhaps out of fear that I would miss them too much, I think I’ve suppressed memories of Colorado’s beauty since we moved to Pittsburgh over three years ago. In the process I’ve forgotten the awe and humility they inspire. We’re at the second to last day of our Company of New Pastors retreat in Estes Park, CO. A good portion of our time spent together so far has been in guided journaling, recalling the ways God’s providence has been evident in our lives. The first thing I was surprised to discover in journaling was how much I’ve forgottenthe times when God’s grace has shown up most clearly in my life. I tend to focus so much on thinking of the future that I forget what God has already brought me through. Remembering the signs of grace that I experienced in my life before moving to Pittsburgh has likewise been humbling, yet liberating. For example, I recall one day in 2003 when I sat on the patio of the UMC at the University of Colorado, basking in sunshine, staring at the Flatirons, listening on my discman to Derek Webb’s song “Wedding Dress.” I was overwhelmed by grace in that experience of God’s unconditional love – it was a moment when I felt secure in my identity in Christ, a beloved child of God, redeemed and given new life to serve Christ. That’s a feeling I’ve rarely felt since, but have been reminded of through this retreat and the rest of our week in Colorado. I’m learning that (as BJ’s charge at my ordination service says) it sometimes requires solitude to remember that identity in Christ, as well as humility. As we leave to go back to Pittsburgh tomorrow – where we’ll dive immediately into the busy-ness of ministry with Saturday’s prayer service, work at 61C, and a sermon to preach at another church on Sunday – I’m resolving to seek ways of deliberately remembering God’s grace on a regular basis. A minister of the Gospel can’t afford to forget the ways the Gospel has been made manifest in one’s own life. Here’s the mp3 recording of most of the ordination service. It’s one long file (1 hour 12 minutes), but the sermons in it are worth the time to download it. It opens with Mike Gehrling giving the prayer for illumination and reading the scripture passages. At 6:00 minutes in, Mary Hammond Atkinson, the moderator of my Committee on Preparation for Ministry begins her sermon, “Get in the Game.” At 24:00 minutes the ordination portion of the service begins with a litany led by Beth Burke, an elder from First Presbyterian Montrose. Bill Forbes, the pastor of my home church in Delta who speaks with a North Carolina accent, follows with the reaffirmation of baptismal vows. Tom Hansen, of First Presbyterian Grand Junction offered the prayer of ordination. At 37:30 BJ Woodworth from The Open Door begins the charge, a message about the practicing solitude for the purpose of remembering one’s identity in Christ. At 57:40 I begin the liturgy for my first time presiding at the table of the Lord’s Supper! Sunday afternoon, back in my hometown of Delta, CO, I will officially be ordained as a Minister of Word and Sacrament in the Presbyterian Church (USA). The road here has been long, and not without a few surprises, which I think will make Sunday even more joyous. I know the people of the church where I grew up are excited, too. They even ran a brief newspaper article about it! Their excitement has reminded me of all the people who have influenced my life for whom I’m grateful: professors, Bible study leaders, pastors, friends, family members. Too many to list here. Many of these people will participate in the service on Sunday, and for their presence there I’m even more grateful. 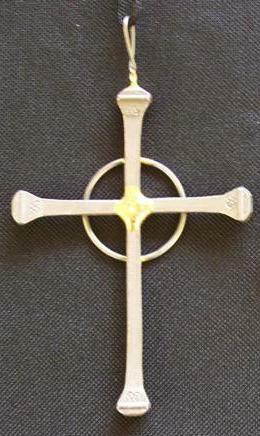 When I was a Youth Advisory Delegate to the General Assembly of the Presbyterian Church USA four years ago, a cross like the one pictured here was given to me. (Some Presbyterians even refer to these as Montreat crosses, because of their association with the Montreat conference center.) The young woman who gave it to me was then a Pittsburgh Seminary student. As they passed out crosses to all of the YADs in the room, we were reminded to place Christ first in all of our decisions at General Assembly. After GA was over, I walked away from the Assembly with a clear sense that I was called to minister within the PC(USA), working for healing and renewal in the church. This Sunday, at my ordination, I plan to wear that same cross as a reminder of that sense of call, as well as a reminder that ministry requires following Christ even in his crucifixion. Knowing that I’m being ordained into a rather unconventional call, as co-organizing pastor of a new church-plant, I take comfort in the words of a short prayer from the Morning Prayer liturgy in the Book of Common Worship: Eternal God, you call us to ventures of which we cannot see the ending, by paths as yet untrodden, through perils unknown. Give us faith to go with courage, not knowing where we go, but only that your hand is leading us, and your love supporting us, through Jesus Christ our Lord. I read about it to Eileen and she immediately asked, “Is it printed on recycled paper?” Great question. Thankfully it is sustainably printed: soy-ink, a mixture of recylced and responsibly harvested paper, and a linen cover produced in a “green friendly environment”. But Eileen’s question does point to something deeper: How often, in the rush to meet a need or fill a new niche, does the Christian publishing industry betray the principles its books promote? The Green Bible is not the first move in the Christian publishing market to provide matching products for the trend. What’s next? Green Bible carrying cases, Green Bible bookmarks, or perhaps trademarked Green Bible brand soy ink pens for underlining in your Green Bible. Thus we prove our depravity. For a much more drastic example, what message does it send when someone is given the Peacemaker’s Bible (pictured here)? Is the man with a gas mask and an assault rifle in the lower right-hand corner what Jesus had in mind when he said “Blessed are the peacemakers”? Why not have a picture of a peacemaker like Martin Luther King, Jr., or even Ghandi instead? (I know, Ghandi wasn’t Christian. But consider the fact that he had the entire Sermon on the Mount memorized and that it was the basis for much of his teaching and action. He didn’t believe Jesus was the Son of God, but he applied Jesus’ words to his own life more than most of us are willing to do.) The reason why there’s a gun on this cover rather than a Nobel Peace Prize is that this is a “target” or “evangelism” Bible, designed to catch the eye of police officers and thus draw them into scripture. But is this really genuine evagelism or just a marketing trick? I absolutely believe the Bible calls us to be good stewards of creation, so I don’t mean to take issue with the idea behind The Green Bible, or the content of its special features. I think it could serve a good purpose. I just hope a bunch of people don’t throw away their old conventional Bibles and waste packaging, gas, paper, and money rushing to buy a new one they don’t need. Doing so would bear witness to our consumerism more than our call to care for creation. The gospel must be proclaimed through a variety of media, but let us be careful that a chosen medium (or method of marketing that medium) doesn’t contradict the gospel. May the principles of stewardship which the Green Bible highlights be embraced by the consumers who would by it, and the industry which produced it.